I love a good steak sprinkled with blue cheese and stuck under the broiler so it melts down into the meat. Oh gosh. Do you love blue cheese too? Do you love parsley and butter? I hope so. 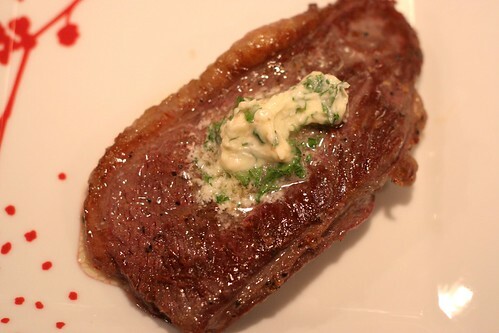 Because I am writing about a parsley blue cheese butter that is so insanely good on steak. It melts and spreads it's goodness over the steak while your mouth waters. Then you take a bite and it's so warm and flavorful. Also, please ignore the gross fat on the steak pictures. This is real life, people. This particular steak was Michael's and he cut the fat off before eating it, so don't worry. My inspiration for this came from my first "official" date with Michael. I was still living 4 hours north of him in New Jersey. 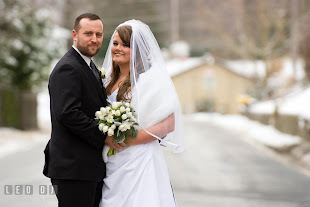 We met in the middle near the King of Prussia, PA mall to go to Ruth's Chris Steakhouse. Fancy fancy. I also got tulips and a long hug... because it took Michael 6 weeks to kiss me. Worth the wait. Anyway, they are famous for their steaks. We both had a filet that was perfectly cooked, tender and flavorful. I asked the waitress how they season their steaks because I wonder about things like that. If I hadn't asked, I would have been wondering about it for the last year. You understand. Turns out they season their steaks with salt, pepper, parsley and butter. Simple as that. A place so famous for steak lets the real meat flavor shine through with very simple seasoning. First things first: gotta cook the steaks. I've spent a lot of time trying to figure out the best way to cook a steak. Is that weird? I found the best way to cook it indoors is to get a screaming hot oven-safe skillet, sear each side of the steak for 2-3 minutes, then pop the pan in the oven to let it finish cooking. I also love steaks cooked on our outdoor grill. I used sirloin for this meal, so they are not too thick. I put my skillet up high and cooked the steaks for about 7-8 minutes on each side. No oven time. It turned out beautifully! When the steaks are done cooking, let them rest. Let them calm down from being all hot and bothered. While this is happening, chop up some parsley. 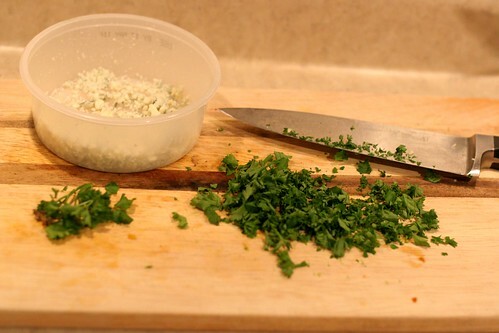 Mix the parsley and blue cheese in softened butter. Plop some butter on each of the steaks and watch as it seeps down into the little cracks. Get excited. Heat up a large skillet over high heat. Add oil. Sprinkle steaks on both sides with salt and pepper. 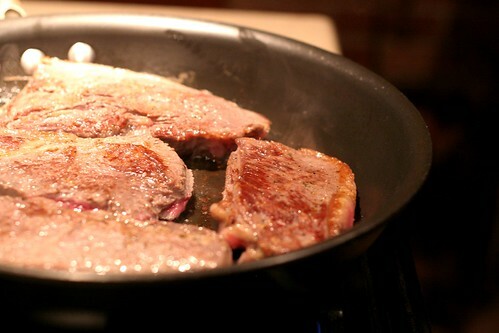 Put steaks in the hot skillet, you should hear a sizzle. Cook steaks on each side for 7-8 minutes or until desired temperature. Let the steaks rest for 10 minutes after cooking. 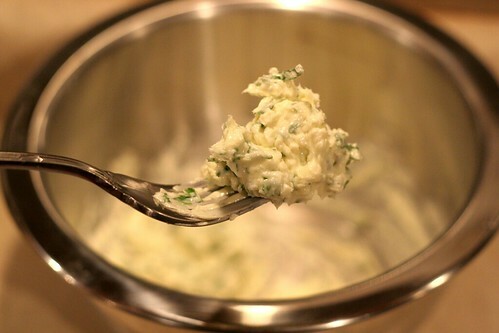 While they are resting, combine chopped parsley, blue cheese and softened butter. 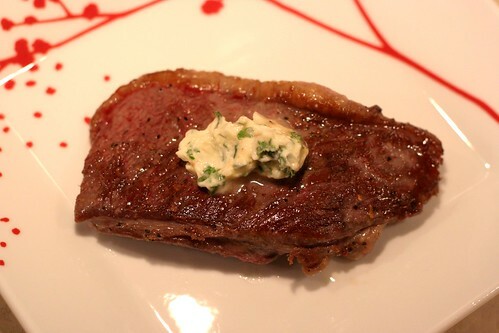 Distribute butter evenly between steaks, place on top to let it melt into the meat. Serve immediately. jenna, even though i'm vegan, i love seeing simple recipes for food! i think cooking a good steak is one of the hardest things to do! kudos! :) btw, do you live in nj?! i do now! 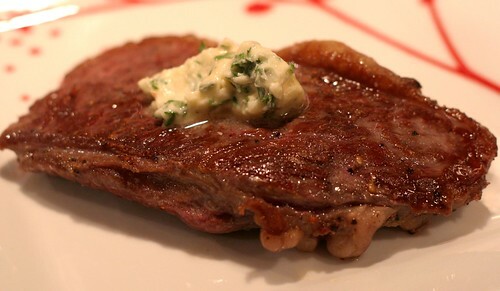 Grilled steak tastes well with blue cheese butter.